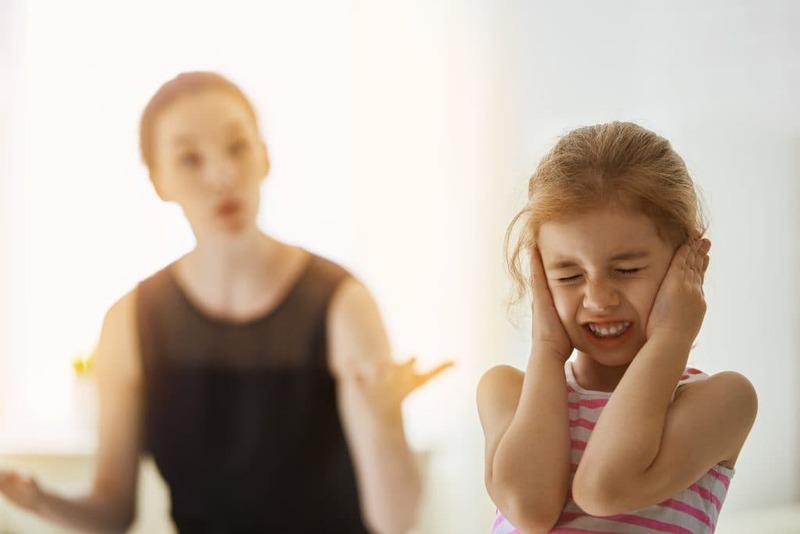 Yelling at your kids can become a hard habit to break but it can also be quite damaging. 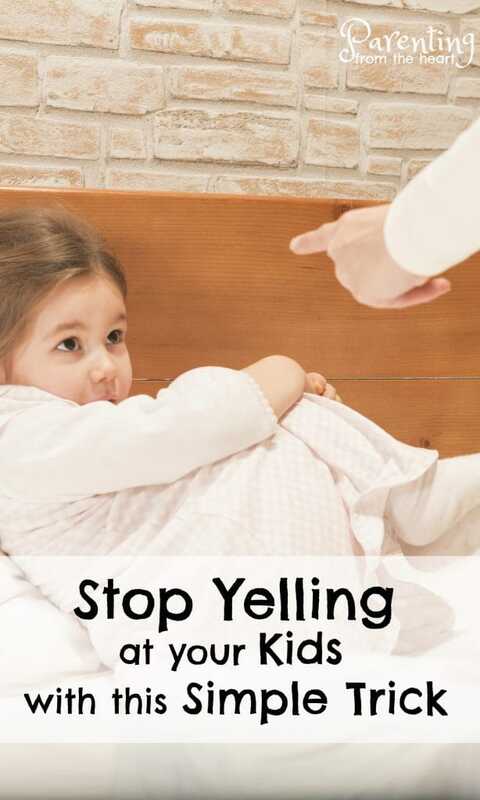 This one simple strategy stops me from yelling at my kids and it can work for you too. Get a free printable with these tips at the bottom of the post. It was one of those hot summer’s days that had blurred into scorching hot summer’s days before it. Seeking refuge from the heat, I decided we would have an indoor day. 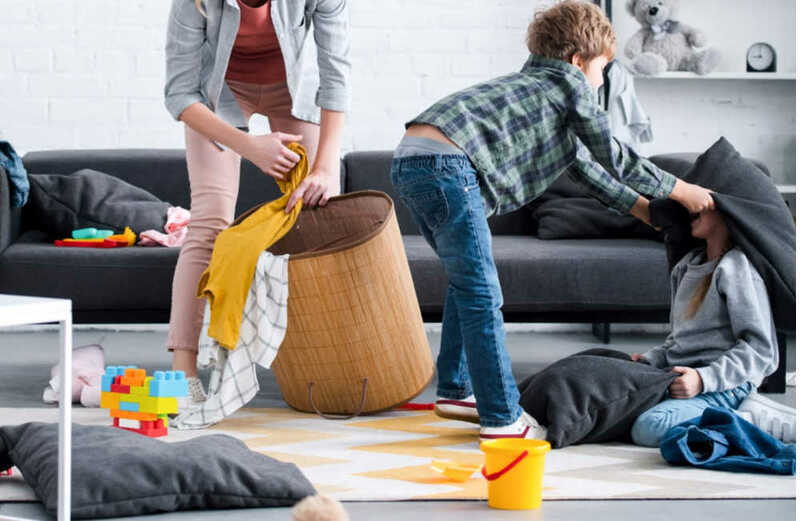 My only plan was to get through a massive list of to-dos while my kids played. I don’t want to be the parent who always orchestrates and oversees my kids’ fun. So I shooed them off to play with some of their favourite toys in the basement. My kids were making a mess and bothering each other while I was trying to tidy. My kids weren’t exactly on board. Sensing my preoccupation, both my daughter and my son started whining. A lot. Any time I made any progress on the kitchen, it felt like two steps forward, one step back. When I was in the kitchen unloading the dishwasher, they were taking out all their Playmobil and arguing. As they pulled out every Disney costume we own, I tried to sweep. I did my best to appease them. Want to watch a show? Why not. You want to take out every single craft supply known to mankind and paint it? Heck, this place isn’t getting any cleaner. Go for it! The kids had had far too much screen time. The more I ushered them away, the more they fought, whined and complained. Despite them begging for attention, I just kept trying to get through the spice cabinet and my pantry. That is until there was one fight too many. I was standing in the kitchen. Both kids were on the stairs. I can’t even remember which kid pushed the other. But it was the proverbial straw that broke the camel’s back. From the depths of my being, I raised my voice to levels I didn’t know I had. I yelled like I never had before. What made it all worse was I was speaking to my kids. Now let’s get things straight, this was neither the first nor last time I had raised my voice. Regrettably, I do lose yell at my kids from time-to-time. But the anger I allowed to boil over that day was so intense that even I was taken aback. The words, “Stop it both of you!” were louder and more shrill than anything I’d ever heard. And I was talking to my kids. Crestfallen, my son dropped to his knees. It was as if I could see his heart breaking. My strong-willed daughter yelled back. With that, she started to cry too. My little ones’ reactions were the most potent reality check I could have had. The anger washed out of me instantly as I grabbed a hold of both of them and apologized. Slowly, it started to sink in. Everything I had done that day had been a lead up to this moment. There are times my kids play independently. They go outside, or play with their toys, or try and make robots out of boxes and whole rolls of scotch tape. But, I had been fighting a losing battle. My kids were craving connection with me. No matter how they tried to get my attention, I remained more focused on task completion than on them. After that day, I read, researched, and reflected. In time, I adopted a powerful tactic to stop me from yelling at my kids. I will preface it by saying that self-care is crucial. If I haven’t slept, had alone time, or finished my stale cup of cold coffee, I can’t parent all that well. Leaving my phone and to-do list are pertinent when tensions are rising. But the biggest strategy that has stopped me from yelling is modelling. In that split second just before I would yell, I take a deep breath. Then, I say as calmly as possible how I’m feeling. Quite literally, I do what I wish they would do when they’re melting down. Except I’m doing it myself. The modelling goes further than that, though. Not only do I identify why I feel as though my blood is about to boil, I also tell my kids how I’m going to calm down. It gives me release. I’m still expressing the anger I feel, however, I’m not losing my cool. I’m modelling how I’d like my children to act when they feel overwhelmed too. For example, instead of hitting my son when she gets frustrated, my daughter now says, “I feel like hitting him!” This is a huge win. And they listen way better than when I used to yell! Though this one strategy to stop yelling at kids has helped me immensely, there are other powerful strategies that help me too. Engage in preventative maintenance – regular self-care is needed to become a calmer parent. Make it a family goal to stop yelling – chances are the kids raise their voices too. Getting everyone on board to communicate in a calmer, more respectful way can be encouraging and more motivating too. Use visual aids – Dr Laura Markham recommends creating a calendar to cross of each day you haven’t yelled. Not only will it help you see your progress, it can also help you get back on track. 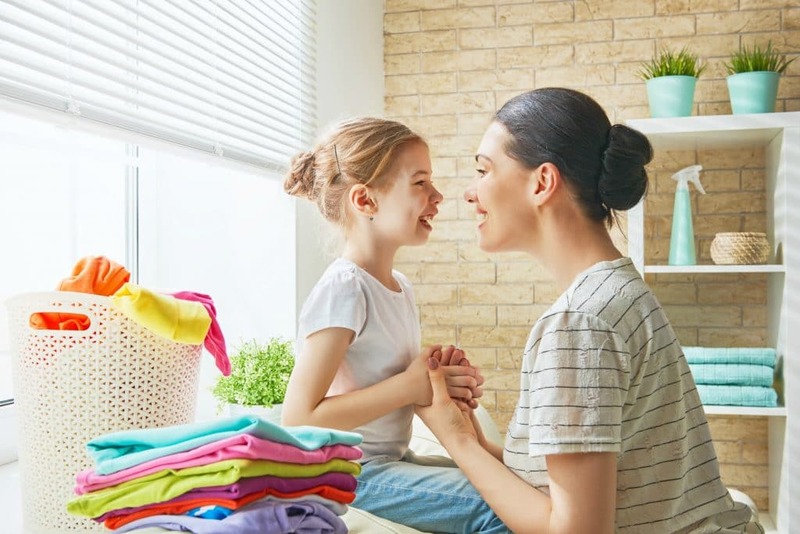 Dr Daniel Seigel and Dr Tina Payne Bryson recommend putting parenting quotes around the house and in the car to act as reminders. Remember that what looks like defiance often isn’t deliberate – when we change the way we evaluate our children’s behaviour it’s easier to stay calm in the heat of the moment. Ask yourself if your child is having a hard time, fearful, anxious, overwhelmed or feeling disconnected from you. Take a deep breath before responding – Dr Becky Bailey recommends making your exhale longer than your inhale to calm yourself in the heat of the moment. You can learn more about this breathing technique below. Since that fateful day where I screamed louder than I’ve screamed before, we’ve made progress. I do still raise my voice. And so, I apologize and explain I’ll try to do better next time. But when I fall short, I get back on track. The difference in our family is palpable. Everyone is calmer. Everyone is more relaxed. I’m still a work in progress but referring back to these tips to stop yelling at kids has paid dividends. Download a cheat sheet filled with reminders to stay calm in the moment. That is a fantastic strategy. I need to count to ten while I take a deep breath because I take a little longer to calm down, but modeling “I feel…” statements is brilliant! I love this suggestion. I have a hard time with yelling. I also find it especially true when I’m tired or trying to get too many things done at once. I’m definitely going to try this technique. I love how you can tell it’s working by your daughter doing it too. Self care is a huge part of how good or bad I respond to conflict in my house and shouldn’t be an excuse for yelling like it is a lot of times. Thanks for sharing your struggle and how you’re learning. I am definitely guilty of this. I think yelling usually comes when you’re at the end of your rope. The idea of taking a moment for self-care is a good one. What a great way to teach your kids healthy emotional expression. I often tell my counseling clients that “Emotions aren’t bad, but it’s what you do with your emotion that can get you into trouble.” By taking a deep breath and expressing how you feel calmly, you are showing them that there are helpful ways to handle big emotions. Way to go momma! I love ur honesty and the fact that, long are the days as full time mums with so much on our heads the never ending “to-dos” list whilst fighting our best to nurse, parent, guide and love our children to the fullest we could. We mums really streach so hard to keep things not only going well but to almost near perfect. Not to scream out of our frustration when children are against our ways? Hard! Srysly very hard! This parenting gig isn’t easy. The important thing is to forgive yourself for when you fall short and try and do better. Thank you so much for your comment. God bless you too. Thank you so much for your comment, Sam. This technique isn’t a fix-all. I find I have to remind myself to do it because my knee jerk reaciton is to yell too much. But, it has helped us immensely. That’s wonderful. Thank you for sharing your experience and perspective. Thank you so much for your comment. As you can tell, I can relate to struggling to stay calm. I can let my emotions get the best of me. I keep coming back to this strategy, self-care and admitting my faults when I make mistakes. I too had two under two. It isn’t easy! But it is a lot of fun… sleep deprived fun that is. I am definitely going to try this. I’m already one to tell my kids when i am feeling frustrated with them and why, but I still struggle with yelling. My question for you has more to do with how you recognized the whole day had been leading up to that because your kids wanted your attention. I struggle with this because I work from home. I spend time with my kids all day on most days during the summer, but I need to work as well. I’ve tried to take a couple hours two days a week to work- I get them occupied and let them know I need to work and the less they interrupt me the faster I will be done and then we can … but it still hasn’t really worked. I get interrupted constantly and they get frustrated and the whole day spirals. Do you have any ideas for the times when you actually have to get things done and cannot give them your undivided attention? (Side note- I’m not talking toddlers or babies. My kids are 6.5 and almost 9.) They are going back to school next week so it won’t be an issue for a while… but it was rough this summer and I would like to have a decent strategy up my sleeve for future school vacations. I can’t begin to express how much I relate. I work from home and this morning was a constant battle of having them interrupt and me finding myself frustrated. 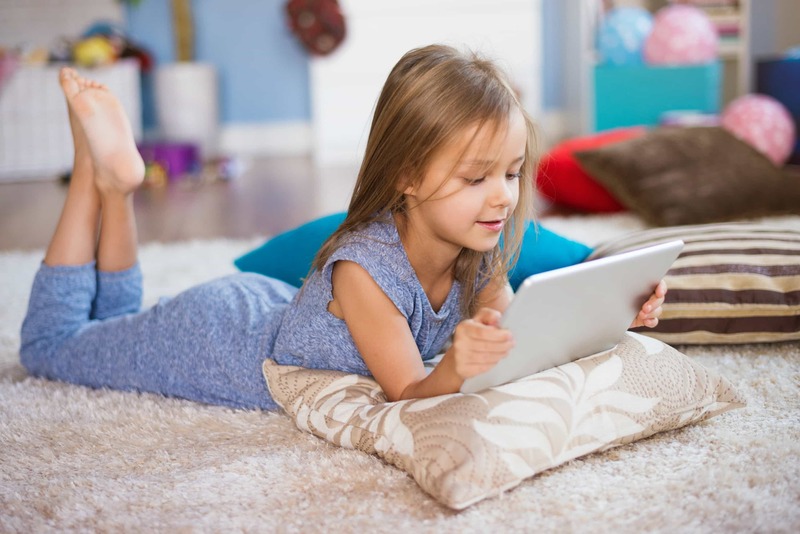 When it comes to giving them attention (feelings of connectedness to improve listening), psychologist Dr. Laura Markham recommends offering each child ten minutes of uninterrupted time with each of your children doing whatever they’d like. So in yours and my situation, this might be before we sit down to work explaining to the kids that we have to work but before that we want to give them a minimum of ten minutes of time doing whatever they’d like (examples could be playing Paw Patrol, painting, colouring, throwing a ball outside, playing a card or board game or doing a puzzle). You can either complete the task with them or set the timer for a brief period. This small amount of time makes them feel validated and important even though it’s so brief. Obviously, there are other ways to connect through the day but this small gesture can improve their listening greatly. When it comes time to sit down and work, explain to them how long you’re allocating for work. For instance, I need to work on this project for one hour. When the timer goes off, I can come back and play with you again. Respect the timer so they trust you’ll be back to pay attention to them when you said. Have lunch, play, help them with what they need help with and then set the timer again. It isn’t a perfect science but I find these two strategies can help a lot. I love the bit about what looks like defiance often isn’t deliberate. So true yet so many parents fail to recognize this. Even those of us that get it fail to recognize it in the moment.